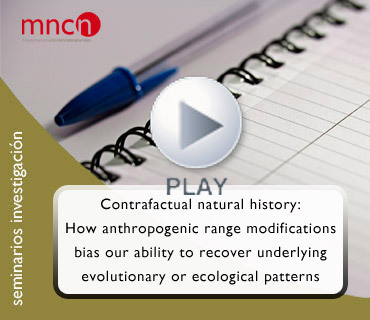 Seminario de Investigación: Contrafactual natural history: How antropogenic range modifications bias our ability to recover underlying evolutionary or ecological patterns. The ongoing conservation crisis is so massive that it has been claimed that we are living in the middle of the sixth mass extinction, and many ecologists and evolutionary biologists have examples of species of their favorite study group whose ranges are substantially modified due to humans. Despite this most global scale analyses work on the explicit or implicit assumption that these modifications are too small to be a substantial problem for the overall conclusions. In this talk I will however try to convince people that such modifications has the potential to cause substantial biases in all or at least many studies. I will start by discussing the magnitude of human modifications of mammalian ranges including evidence for an anthropogenic causation of the massive Late Pleistocene/ Early Holocene megafauna extinctions. Following this I will compare the results from analyses based on contemporary distribution patterns with results based on reconstructed potential distribution patterns for all mammals as they could be without human involvement based on three case studies. 1) I will show that estimates of Bergmann’s rule (the tendency of mammals to increase in size at higher latitudes) are underestimated based on contemporary distributions because humans have mainly influenced the distributions of larger mammals and have been especially important at higher latitudes. 2) I will show that the underlying dynamics behind the interchange of mammals between South and North America after the collision of the two continents ~3.5 million years ago (the Great American Biotic Interchange: GABI) cannot be meaningfully understood based on contemporary distributions. 3) I will show that range contractions among North American mammals causes substantial biases in estimations of their niches which makes reliable estimations of the consequences of global warming problematic based on contemporary distributions. Presenta: Miguel B. Araújo, Departamento de Ecología evolutiva, MNCN-CSIC.